CBVCTs need a minimum of infrastructure to function. This means spaces and times to operate effectively. This section deals with the main practical requirements for running a CBVCT. A CBVCT service aims to be easily accessible to MSM. This is why a thoughtfully selected location and setting can improve results. As a targeted CBVCT, one of the most important keys to success for a checkpoint is its physical proximity to the most-at-risk populations it aims to address. tests are offered in the CBVCT setting. tests are offered in community partners’ facilities, in gay venues (clubs, saunas), in market places, hairdressing salons, pharmacies, etc. Mobile units (vans) offer the flexibility of changing their location and can be used near a community’s fixed place when there are not adequate conditions for carrying out the test; confidentiality, safety and hygiene. Different locations will match the criteria above depending on the needs and living conditions of local MSM. Depending on the setting, some criteria might be more important than others: if the key population are ‘out’ gay men using gay venues and saunas in a particular city precinct, proximity might be more important than a neutral location and confidential environment; if the key population is socially disadvantaged and discrimination makes it dangerous to be ‘out’, a neutral location, confidential environment and closeness to public transport might be the priorities. For example, Barcelona CBVCT is easily recognisable and located in the gay nightlife area of the city (http://www.bcncheckpoint.com/bcn-checkpoint/?lang=en), while Athens Checkpoint (http://mycheckpoint.gr/?page_id=125) and Legebitra in Ljubljana (http://www.legebitra.si/ves-svoj-hiv-status/) are in a central, but more neutral locations with more generic or no special signage. Some CBVCT use no obvious signage apart from e.g. a neutral doorbell for entry, responding to client concerns regarding being seen entering a checkpoint. These choices need to respond to feedback from the key population and it is important to review them regularly as attitudes change. Considering mobile and outreach services instead of a fixed checkpoint. Direct input from the key population about their needs and preferences and their participation in the decision helps with selecting a suitable location. The Participatory Quality Development tool (PQD) offers methods to consult and involve MSM, even if only little time and few resources are available. 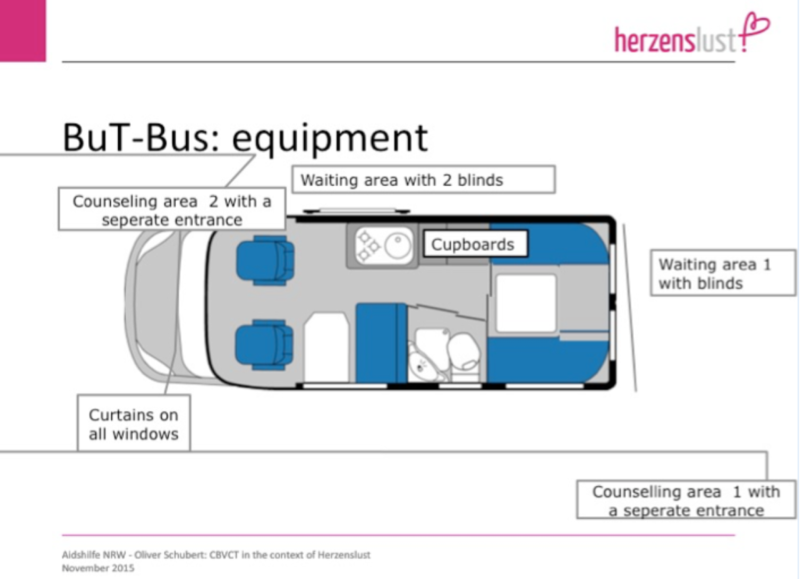 Operating a CBVCT requires a minimum set of separate spaces suitable for confidential counselling and testing, as well as furniture and other equipment. Because of the large variety of spaces and settings used for CBVCTs, from shopfront offices and the temporary use of rooms in an existing community or health centre to mobile units in vans and outreach teams in MSM venues, there is not one way of setting up the space. It may be best to look at several existing examples of checkpoints and mobile units before making plans, and then asking the personnel for their input as well. At a minimum, how the space is set up needs to ensure that reception, waiting, testing, counselling, testing and administrative functions can be carried out with regard to a welcoming environment, confidentiality and safety. There are some practical considerations that will influence how you adapt the available space and how you organise furniture and equipment. Some will depend on local regulations regarding e.g. safety and disability access. Others need to respond to the living conditions and cultural expectations of your local key population(s) as well as the staff – paid and unpaid. For example, reception and waiting areas may need to be screened off to respond to concerns about confidentiality. Playing music outside the counselling/testing room and some visible soundproofing inside can increase privacy and a feeling of safety. The style of decoration can also influence how welcome and comfortable clients feel in the space. Sponsorship for furniture, vehicles and equipment. Question two of the Euro HIV EDAT Self-evaluation Grids focuses on how the service is organised to respond to the key population. Direct input from professional staff at the planning stage or when changes are made can help set up the space in compliance with relevant regulations and conducive to the required workflow. Consulting volunteers and the key population about their needs and preferences can help with making the space welcoming and comfortable. The Participatory Quality Development tool (PQD) offers methods to consult and involve stakeholders, even if little time and few resources are available. Hours of operation mean the days and times when the CBVCT is open for counselling and testing. Choosing the right hours of operation is central to the success of a CBVCT. Opening times that make it as easy as possible for MSM to attend can maximise success in reaching those most at risk of HIV infection. In some cases, a fixed CBVCT with set opening times is not sufficient and may be replaced with or complemented by a mobile unit and/or outreach to places frequented by the key population. Be located at easily accessible areas. Create a comfortable and friendly environment. Offer mobile services and outreach activities in order to reach those that wouldn’t (or couldn’t) go to CBVCT centres, or those doing the test because they have the opportunity. Provide free-of-charge or very low-cost services. Choose opening hours or provide testing outside working hours (evenings, weekends). It is essential to adapt hours of operation to local customs, conditions and the needs and preferences of the key population. In most cases, this means opening the services outside of ordinary working hours, including evenings and weekends. The times that best suit the key population may be more difficult to manage for staff and volunteers. It is likely that some adjustments have to be made to opening hours after the initial set-up and the first period of operation. Including questions about opening hours in client feedback questionnaires can inform further adaptation. Consulting the key population, professional staff and volunteers about opening hours at the planning stage or when changes are made is necessary for maximising access and service uptake.